For the financial services industry, the explosion of digital and specifically social media marketing is offering more opportunities with targeted marketing than ever before. In the past three years, the change from chronologic to algorithmic-based social media feeds has all but killed organic content. It's also made one thing clear for social media marketing – if you want your content to play on digital channels, you’d better be willing to pay. The shift to paid social comes with a major benefit for financial service marketers. There are mass amounts of audience data from social channels, and the ability to create extremely refined and customized offers. What once were elusive and hard to find audience segments are now a few Facebook / Instagram / Twitter / LinkedIn keywords away from being touched by marketing efforts. For example, look at marketing giant American Express. They’ve won awards for innovative solutions that allow customers to connect their credit cards to their social media profiles. Amex uses this data to target their customers with social posts on deals and statement savings based on their activity (likes, shares, check-ins, geo-tagging). The spending trends for for digital marketing by Financial Services backs this up as well. In a 2015 eMarketer report on US digital marketing trends by vertical, Financial Services came in third place for total digital marketing spending, coming in at a huge $7.2B total. In addition, the same report found that for Financial Services marketers $4.7B of their total was being spent on direct response digital marketing initiatives where targeting is most important (vs. branding initiatives). This data shows us that financial service marketers are increasing their digital marketing budgets, and relying on targeting to hit more specific audience segments. To get the right bang for their buck, they should place as much effort into ensuring visuals match targeting. Even for companies with limitless budgets and resources have little return on their efforts if the content misses the mark. Digital marketing is too competitive and too quickly digestible to waste valuable dollars on poor content visuals. To truly make the most of the targeting, visuals must be customized to speak directly to your brand's target audience. Chase is trying to connect with small-to-medium business owners, and specifically within the San Francisco-Oakland / Bay Area. They make a local connection to their targeted audience by showing an actual Bay area business with tasteful onsite images vs. relying on generic imagery of flower shops. Subtle integration of products in-use shows how Chase helps its customers, while still maintaining the overall feeling of a spotlight piece. 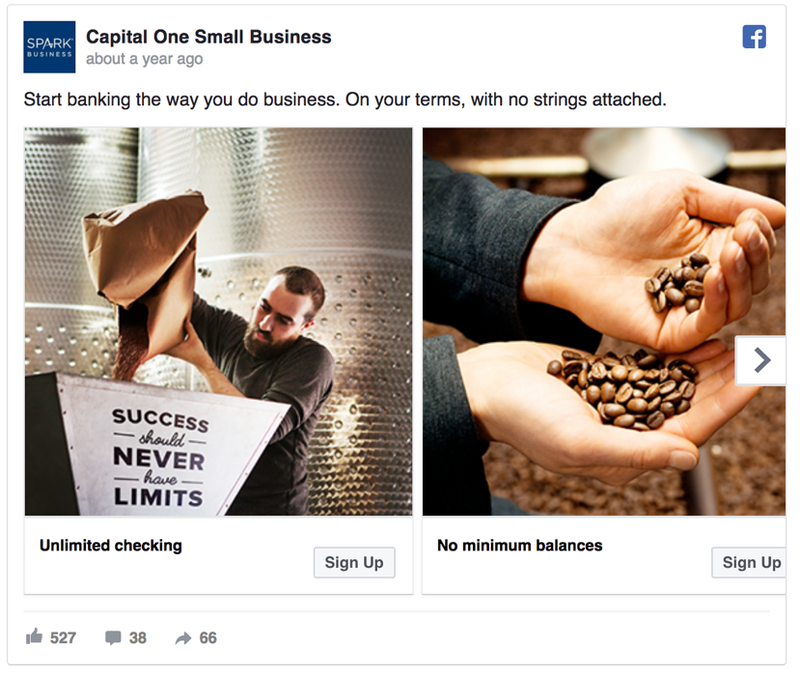 Capital One is trying to make a connection between small businesses and their customized small business service offering. The visuals used have a generic feeling to them and do not represent the typical style of Capital One branding. Superimposing their small business banking slogan ‘success should never have limits’ looks out of place and forced. There's little relevance between images and text, and no obvious small business banking connection. In these two examples, it's easy to see the difference between how Chase and Capital One market themselves on social channels. They offer similar services to similar consumers, but there's a clear difference in how they use content. Chase creates a clear but subtle line between their visuals and their services. 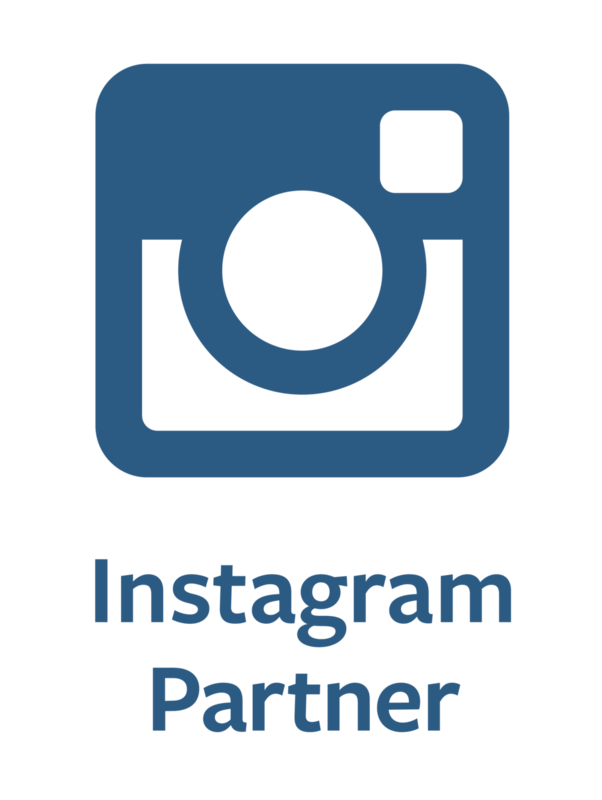 They target their prospects with relevant images and matching copy that reflects their brand identity. On the other hand, Capital One almost considers the visuals as an afterthought. This makes for a tough connection to the intended audience. Beyond a qualitative analysis between the two example brands, its proven that custom content works. In a study by Time Inc. they surveyed 17,000 people across various generations. The goal of the study was to identify consumer perceptions towards custom content, and their feelings towards how brands use custom assets to integrate themselves into customers’ worlds. The results showed that 90% of respondents prefer brands that use custom content to engage with them. Similarly, 89% of respondents said custom content is the best way for brands to break through the clutter and stand out from the competition. These are stats that marketers can't ignore if they want to manage an effective digital marketing strategy. Eager to learn more about how best to customize content for your financial service brand? Learn about how MasterCard created localized custom content at scale using Shutterstock Custom or book a demo and speak to one of our specialists about how to build your own brand's unique visual identity.